There's always a surprise inside, hiding in the grain. Every wood is different, in the way it looks and smells, but also in how it reacts to a tool and to being shaped, and how it releases its secrets to the worker. It wasn't long ago that people had few belongings, and the ones they did have, they cherished. Items were made to be beautiful, to be enjoyed, to be appreciated. Nowadays, we can get a box of pens for a couple bucks, but we don't enjoy using them. I love making an everyday item beautiful enough to cherish. 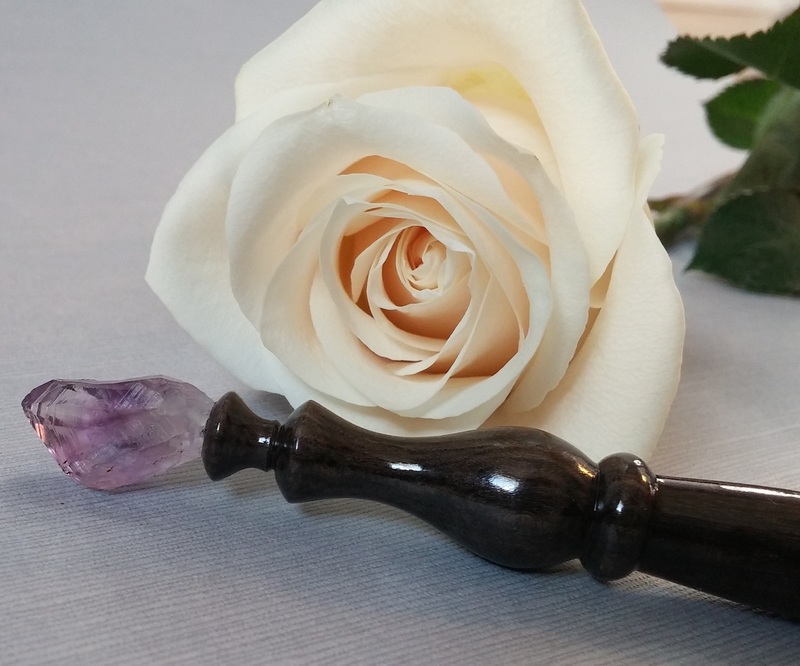 Mercure Pens was launched in early 2015 with the realisation that other people loved the beautiful magick of wood and crystals as well, and my desire to share my creations with them. Ebony and amethyst are a such a natural match, and this curly figure is so well complemented by the rough, natural beauty of the crystal. The warm tones of the wood are brought up so perfectly by General Finishes Waterbased Turners' Finish. I first apply two coats of varnish and allow the grain to rise before sanding that down with the coarsest grit of MicroMesh. I then apply up to 10 coats of varnish until I'm happy with the coating. I then meticulously sand through all grits of MicroMesh to flatten and remove any specks, working up to a fine gloss. This brilliant piece of tulipwood waited a long time to find its voice, sitting on the shelf, waiting for something special. What was thought to be a small knot turned out to be a hole straight through the wood. A chance for magic. The beautiful grey swirls of the grain contrast with the vivid pink tones, and perfectly complement the silvery purple freshwater pearl that sits atop as a crown. The hole is filled with crushed pearl shell and peeks out like a pair of glistening eyes. The finish is shiny like a calm lake and the depths within. This dainty pen, turned from red mallee burl evokes deep, dark dreams with its black tourmaline, rising like a puff of smoke. It would be easy to get lost in the swirls of the grain of this beautiful wood, made more vivid by General Finishes Waterbased Turners' Finish. I first apply two coats of varnish and allow the grain to rise before sanding that down with the coarsest grit of MicroMesh. I then apply up to 10 coats of varnish until I'm happy with the coating. I then meticulously sand through all grits of MicroMesh to flatten and remove any specks, working up to a fine gloss. This extra long rosewood pen, set with a beautiful small piece of malachite, truly makes a statement. The grain is amazing and simply pops under the many layers of varnish that has been polished to a fine gloss with General Finishes Waterbased Turners' Finish. I first apply two coats of varnish and allow the grain to rise before sanding that down with the coarsest grit of MicroMesh. I then apply up to 10 coats of varnish until I'm happy with the coating. I then meticulously sand through all grits of MicroMesh to flatten and remove any specks, working up to a fine gloss. Torrefied maple has been roasted to create the beautiful caramel colour you see here. Both the pen and the card holder have been finished with General Finishes Waterbased Turners' Finish. I first apply two coats of varnish and allow the grain to rise before sanding that down with the coarsest grit of MicroMesh. I then apply up to 10 coats of varnish until I'm happy with the coating. I then meticulously sand through all grits of MicroMesh to flatten and remove any specks, working up to a fine gloss. I apply one last coat of varnish before polishing with only the two finest MicroMesh grits.